A pillow-top mattress could be a great option if you are looking for that additional plush comfort and cloud-like sleeping sensation. If you prefer a traditional coil feel but still want to sleep on a modern mattress with all of the benefits they bring, this should be the perfect fit for you. If you’ve made up your mind, all you need to do is find the bed that will suit your all your needs while staying within your budget. 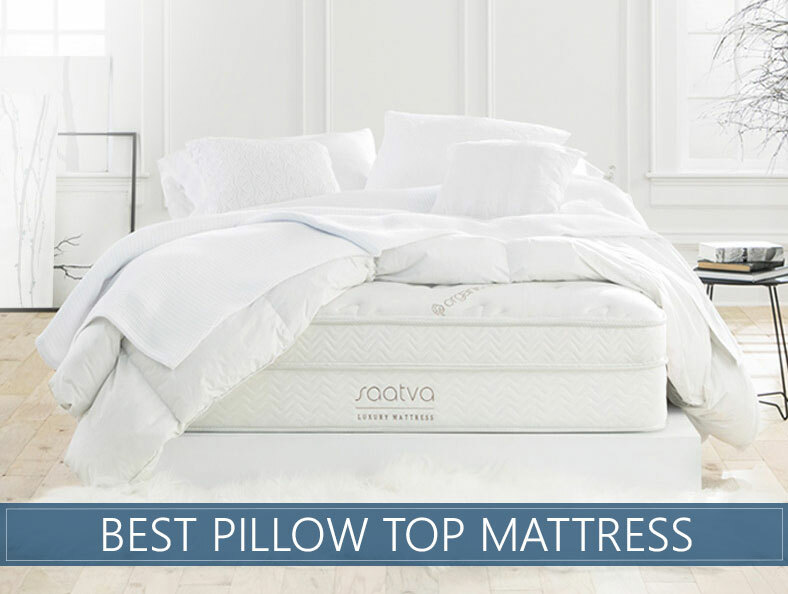 The problem is – how do you know which pillow top mattress is best? Let’s take a look at our top picks and how to get the best deal available. 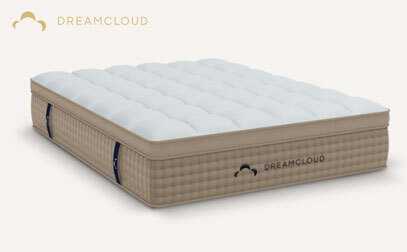 DreamCloud’s approach to luxury is to take 8 layers of premium materials and top it with a high-end tufted cashmere cover for an exceptionally soft and plush finish designed to make you feel like you’re sleeping on a cloud. This 15-inch hybrid is built with both foam and pocketed micro coils that deliver a medium-firm feel, which is often preferred by most sleepers and couples. Why is it special? Though many competitive brands use adhesive to attach their layers, DreamCloud uses a hand-tufted process that is less likely than glue to break down over time. Its Euro top is packed with luxurious pressure-relieving foams, including gel memory foams and latex, that are quicker-responding on the surface that should keep you from feeling stuck. Furthermore, DreamCloud is backed by one of the most generous sleep trials in the business, which gives you a full year or 365 nights to decide if this is the bed of your dream. The company also offers an industry-leading Everlong Warranty which lasts for as long as you own the mattress, a feature that can add substantial value to this mattress. 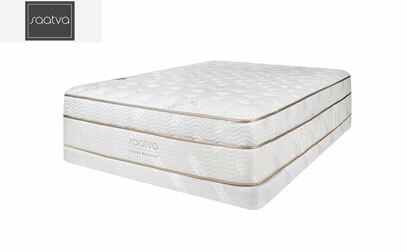 The Saatva Company flagship innerspring mattress introduced luxury and more eco-friendly materials to the online space back in 2010, and the bed’s Euro-style top layer of memory foam sets it apart by providing a quicker-responding plush top. What stands out? Traditional memory materials can often make a sleeper feel trapped in the bed, but Saatva’s incorporated more responsive memory materials that are well balanced by the coil-on-coil support system that should provide a much gentler cradle nearer to the surface of the bed. The core of the bed is built using two separate sets of coils. First, a pocketed system of micro coils conforms to your shape for pressure-reducing body conformance and better motion isolation. The second coil system is connected to reduce sagging over time. Because Saatva does not roll their mattresses into boxes, they are able to use materials that are not as easy to compress, and each bed uses foams that source a portion of their oils from sustainable sources. Every bed is professionally delivered and installed, for your convenience. Find more about this innerspring/hybrid model here. A potential downside of softer pillow top is that some softer materials have a tendency to break down quicker, depending on what is used to build them. With WinkBeds, durability is a cornerstone of their business, and it’s their intention to hand-build sturdy beds that offer consistent comfort and support over years of use. This bed’s coil-on-coil support system combines pocketed micro-springs with pocketed innersprings, and rested on top are two layers of foam: A quicker-responding and soft surface foam for easier repositioning and a denser memory foam for contouring and pressure relief. 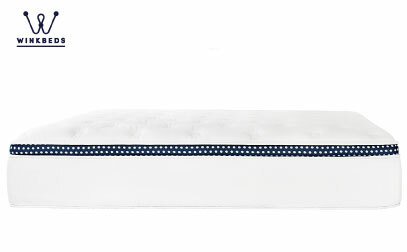 The entire bed is wrapped in a soft cotton cover with an attractive blue and white ribbon around the perimeter. What is unique? 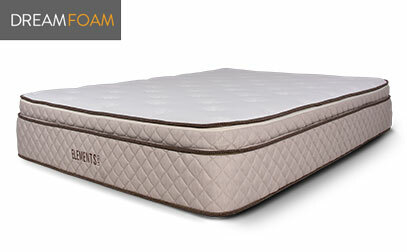 According to the company, this hybrid has been tested to simulate a year of use and it was found that the mattress lost less than one percent of its loft in that span of time, which indicates excellent long-term durability and stability for both the coil systems and its Euro-style pillow top. Sleepers that carry significantly more body weight should also note that the company has designed a WinkBed Plus, which was specially designed to maintain its durability for sleepers weighing over 300 pounds. We made a full review which you can read here if you want to learn more. Eco-friendly beds are growing in popularity every year, but many, especially in the retail space, can cost thousands of dollars and be cost prohibitive for many consumers. By using an online sales model, Avocado wants to bring a more organic experience for sleepers for a more affordable price, and their hybrid is built with a zoned upcycled steel coil unit that has a Dunlop latex Euro-style pillow top. What makes it special? This company has gone the distance to certify their all-natural hybrid, securing certificates from third-party organizations such as GREENGUARD, eco-INSTITUTE®, and OEKO-TEX®. Cotton used in the cover and wool used as a flame retardant layer are both certified organic. For those craving extra softness, you can opt to have another layer of Dunlop latex sewn into the mattress beneath the cover. This material should give the bed a soft body conforming and responsive feel unique to latex, and the entire bed is covered by a generous 25-year warranty. 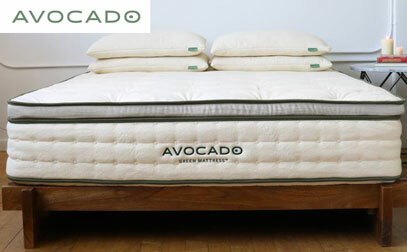 Read our full review of the Green Mattress made by Avocado. To round out the list, Ultimate Dreams Latex is a best budget choice because it provides certified comfort and features that are unique to beds at this price point. For instance, the bed is customizable, allowing you to choose your preferred feel from firmnesses on a range from 1 to 10. The Euro Top is made from 3 inches of breathable Talalay latex, a process that produces a softer and more consistent foam that should cradle your pressure points without letting your body overheat. This is followed by softer reflex foam and a dense base that should provide good support for your spine. The zippered cover allows for the removal of the comfort layer, if you prefer. What stands out? Dreamfoam, the manufacturers of this bed who are owned by Brooklyn Bedding, is aimed at providing top quality materials at exceptionally affordable prices so you can rest assured you’re receiving a lot of value for your dollar with your investment in this mattress. Pillow tops are most commonly implemented on beds with an innerspring construction. This is a mattress that is usually described as a bed which has a few inches of additional padding that’s comprehensively sewn on its top layer. This particular padding is designed to deliver additional softness, comfort, and contouring. It could be made out of memory foam, regular foam, fiberfill, wool, gel, latex or others of the kind. If the pillow top is integrated within the mattress for a unified appearance, this is referred to as a Euro top. If the cover is lying independently on top of the other layers, it is referred to as a standard pillow top. We will dig in the differences between both down below. The main intention of the pillow top mattress is to deliver a synergistic blend of push-back, bounce, and enhanced comfort. Since innerspring mattresses are typically incapable of delivering that plush sleeping sensation that a lot of users are very fond of, they are finished with a nice and luxurious pillow top to balance out the feel. They deliver superior motion isolation. Innerspring beds are not known for particularly excelling in this regard, and usually, you’d be able to feel every movement of your partner. With a nice pillow-top cover, you can get rid of this issue in a lot of cases. The cost may be significantly lower. A high-quality hybrid between innerspring and memory foam or gel can sometimes cost you a small fortune. Some pillow-top beds you can find, on the other hand, are far more affordable. Of course, it wouldn’t be fair to point out the pros without paying the necessary regard to the potential considerations of these solutions. These beds can have certain drawbacks, and it’s important to take a proper look at them as well to make sure you pick the right brand. The Heat. That’s the main consideration and concern to be accounted for. Pillow-top mattresses, if not made correctly, can be extremely hot. Some can retain a lot of heat, and this could be incredibly troublesome throughout the night. This goes out to pillow tops which are specifically made mostly of traditional memory foam or other materials which are dense without a breathable design, but you can find plenty that will evade this issue just fine. Indentations. Some beds are known for forming indentations. This is the case when the mattress is made out of low-quality materials. Therefore, we strongly suggest looking for solutions made out of high-end memory foam or latex instead of regular foam that is completely traditional. They can also offer better back and spinal support in some cases. They require special bed sheets. This is another thing that you’d have to be well aware of. Depending on the brand, you may need to investigate whether or not you would have to purchase special sheets or if regular ones will fit on your pillow-top unit. So if these potential drawback are too much for you, then we recommend you to check our Top 12 Beds of 2019 here. The main difference between Euro-top and pillow-top beds is that the former is kind of incorporated in your bed while the latter is lying on top of it. This brings a better and more finished appeal for the euro-style pillow tops as they tend to be far more elegant in terms of design. They are also usually made of higher quality materials. Of course, they come with certain considerations as well – the beds may seem a bit bulkier. In certain situations, you might even have to consider a special bed frame. Apart from that, though, both usually bringing superior comfort and enhanced sleeping sensation. Obviously, the first thing that you would have to consider are the materials. This is a critical consideration that you shouldn’t disregard. Make sure that you go for a unit that’s made out of high-quality foams. You can note that latex can be a great alternative if you sleep very hot. Heat retention is one of the most challenging things you’d have to be aware of when it comes to purchasing a pillow-top mattress, and the materials that it’s made of play the most important role here. Additionally, you can decide whether or not you want it to be regular pillow-top or euro-style as the difference can be substantial and have an impact on the overall comfort as well. Pillow-tops are usually implemented to make firm beds softer. With this said, you should be expecting the bed to be slightly less firm if it has a pillow top. That’s its essence – to deliver a nice balancing feel between the pronounced push-back and bounce of the innerspring bed and the plush and softness of the pillow-top. Of course, the most important thing to consider here is the support. Failing to pick the right pillow-top mattress could result in improper spinal alignment. Now, the price range of these is rather broad depending on the brand, materials, as well as the remaining construction of the bed. Typically, you’d have a choice between a range of affordable and highly expensive units, so it’s all up to you and the amount of money that you want to spend. Some of the brands offer 10 years while others would go so far as to offer 25 years of warranty. Generally, using a product for 10 years is seen as standard, so a longer warranty may be of varying importance to you. Why is my mattress too hot? The most common reason for your mattress sleeping too hot is the material. If not properly accounted for, pillow-top mattresses can receive a lot of complaints about the lack of proper thermal regulation when they are made of regular foam or traditional high-density memory foam. These materials, in general, lack the proper abilities to dissipate heat but instead, they retain it, leading to a lot of hot nights. For those who sleep too hot, we recommend a good cooling bed. Check our top cooling bed picks here. How to get rid of lumps in a pillow-top type of bed? To help combat this, you can consider purchasing a pillow-top that’s using latex as part of the composition. This material should prevent lumps, as should any brand that is properly constructed. However, if your pillow top mattress is lumpy, you can try to distribute the lump throughout the cover evenly; usually, it’s not hard, and you can do so by using gradual movements of your hands. You may also need to look into the warranty in this case. All in all, pillow-top beds, regardless of whether you go for a standard or a euro-style one, are a great choice. If you prefer a luxurious, soft, and rather plushy sleeping surface with the expressed bounce and push-back of coils, these beds may be your best option. It is important to understand that they can be super comfortable and they strike a nice balance between softness and firmness – as curious as it may sound. That’s why a lot of people prefer them. Of course, finding the right one is always a matter of some proper research. We hope that with this piece you’ll be able to hit the sweet spot without making a lot of attempts.